You will be prompted to log in when adding a publication or PDF to your cart. New users can create a free account at that time. 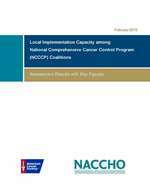 In 2014, NACCHO and the American Cancer Society conducted a survey to better understand factors that hinder partnerships among local health departments, other local stakeholders, and NCCCP-funded coalitions in each state. The survey also aimed to identify effective strategies for raising local health departments' awareness of NCCCP efforts and to facilitate linkages between local health departments and state CCC coalitions for joint planning and local implementation efforts. This research report presents findings from the survey. To download a PDF, you will need to register for a free account to obtain a log-in. You’ll then log in, add the PDF to your shopping cart, and complete the ordering process. After you have placed your order for the PDF, you will be able to access it in your “My Transactions” and download it as many times as you’d like.